If you’re looking for a part-time ESL tutoring job, there’s a company called DaDaABC hiring a contract position that might be perfect for you. There’s a lengthy application process, but some teachers can make up to $25 an hour! If you’re accepted, you’ll be hired on for 12 months, at that time your contract can be renewed. If you’re interested in a high paying work at home teaching job, read on to learn more. You can also visit their FAQs to find out a lot of great information about the position! If you have additional questions, they have a support team on their site ready to give you the answers! Trial Classes: These are classes for students either studying with DaDaABC for the first time or are looking for a full-time teacher. Last around 14 minutes. Elective Classes: Extra Curriculum classes focused on specific topics. Last around 30 minutes. Major Classes: Your regular students in schedule time slots. Last around 30 minutes. The goal is for you to have regular students in scheduled slots each week. This means you’ll be able to work with the same students over and over again progressing with them, instead of switching from random students. One topic that comes up with tutoring sites is what if a student does not show up to a scheduled class? They ask you to stay in the lesson, report it, and you’ll have special pay. DaDaABC is looking for part-time ESL teachers to teach from home. 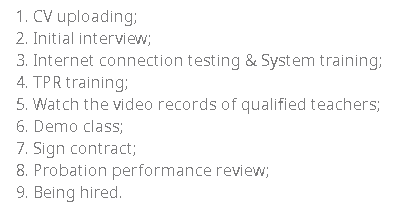 If you’re interested in the position, below are the necessary requirements. If you can meet the requirements, you can apply to be an ESL teacher by visiting their website here. The first step is to fill out an application on their website. It consists of basic information and your contact information. They list on their FAQs that you should hear back within three days, if you don’t, you may not have been included in the recruitment process. They list contact information you can get ahold of to find out more information. Once you hear back, the next step is an initial interview. They conduct the interview through Skype or WeChat. If all goes well, you’ll be given a login for the next part of the application process, internet connection test, and program training. The next step is what they call TPR or Total Physical Response Training; this step aims to determine your teaching style and develop your teaching skills. Once you’re done, you’ll need to watch some videos of other teachers and then you’ll have a demo class. If all goes well you’ll sign a contract, go through a probation performance review, and then you’re hired. How Much Does DaDaABC Pay? Pay is dependent on a few factors, but you can make up to $25 an hour. Your pay is determined when you sign the contract based on your TPR training results and your demo class performance. They do mention that there’re bonuses for high-quality teaching along with bringing on new students to the company. 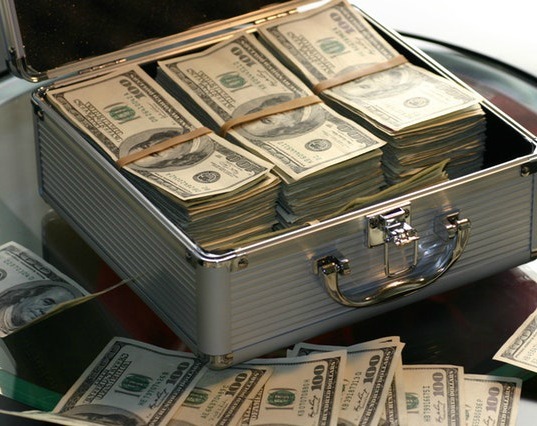 You’re hired as an independent contractor, so it’s on you to report income come tax time. They also mention that you can get a raise. They reevaluate wage every 12 months. DaDaABC pays it’s teachers monthly on the 15th of the following month. For example, January earnings are paid out around the 15th of February. Based on your location you can get paid via Cash, Domestic Bank Wire, Overseas transfer, AliPay, WeChat, and PayPal. *Some payment methods include a transaction fee. An overseas transfer will take 2-5 days. They would like you to keep to consistent schedule, but if you do need to change, they require a 30 days notice in advance. If you’re interested in teaching for DaDaABC, please follow this link to start the application process. Again, they have a great FAQs section that I highly recommend reading for more information! Here’s an awesome guide from a current DaDaABC teacher to check out. 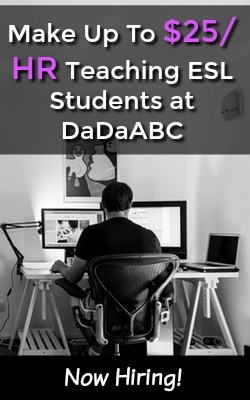 What are your thoughts on the ESL tutoring position at DaDaABC? PK Fish Review: Is Teaching for PK Fish a Scam?